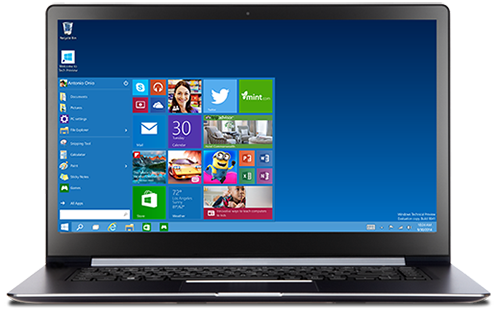 Technical preview of Microsoft Windows 10 has been shown up to the market. It's an incomplete release of next operating system. Till yet Windows 10 is in its pre-beta stage. Some of the features have been shown up through the technical preview and we are expecting more from the final release. You can easily install and test Windows 10 technical preview but remember one thing, don't install it on your main computer on which you work daily rather use another system or you can use virtual interface because it's an incomplete version of Windows. There can be lots of bugs and app crashes and lead to loss of data. People are loving Windows 10 because Microsoft has announced that it will run across an incredibly broad set of devices. According to Microsoft Windows 10 can run on devices which have 4-inch screens to 80-inch bigger screen. Soon you will be able to run Windows 10 on smartphones, tablets, desktop, laptops and much more small gadgets. Microsoft has added some new keyboard shortcut keys in the Windows 10. Lots of new goodies has been added in the Windows. Here are the newly added Keyboard shortcut keys. WIN + LEFT or RIGHT – Snapping Window. ALT + TAB – Switch to Recent Window. WIN + TAB – Task View. WIN + CTRL + D – Create New Virtual Desktop. WIN + CTRL + F4 – Close Current Virtual Desktop. WIN + CTRL + LEFT or RIGHT – Switch Virtual Desktop. Microsoft has enabled Ctrl+C (Copy) and Ctrl+V (Paste) features in command line. You can easily select the text using shortcut keys Shift+Left Arrow, Shift+Right Arrow, Shift+Up Arrow, Shift+Down Arrow. Till yet Windows 10 is it's developing phase just the technical preview has come to know about all the bugs and crashes. The thing that i personally liked about the OS is that it will run on almost all the devices without any restrictions. You can then say only one app store for all the systems and devices. Microsoft CEO Satya Nadella said Windows 10 is the first installment in creating a platform that can run on multiple screens as well as the Internet of things. He also said the one Windows strategy could be as much about running sensors as well as the form factors everyone knows today.